Why Be Curious? Here’s a Nebbiolo blend etched by an extinct volcanic terroir of red-brown porphyritic sand. 300 million years ago, a volcano created the raw material for the Bramaterra DOC and eight other geographically complex appellations, collectively known as Alto Piemonte. 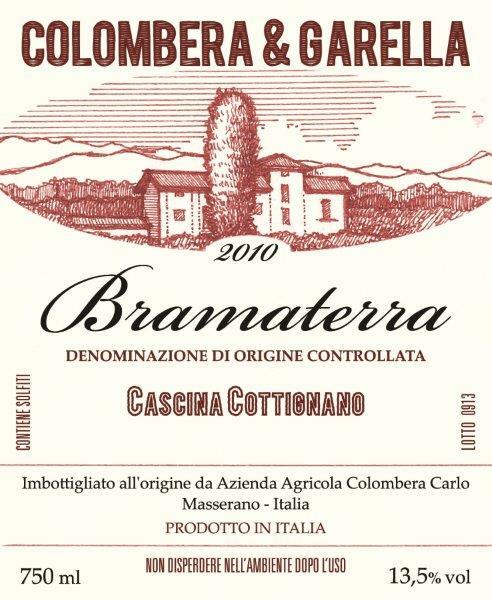 Bramaterra allows more of the varieties Croatina and Vespolina than most of the other Alto Piemonte DOCs. These varieties add resonance and spice to the wonder that is Nebbiolo, while the volcanic soils and more northerly latitude give wines of a particular elegance, perfume, and refreshment compared with the more powerful Nebbioli from Barolo and Barbaresco to the south. Produttore / Producer: Colombera & Garella is project of with Cristiano Garella, Alto Piemontese wünderkind and leading consultant for a number of properties, with his long-time friend Giacomo Colombera, and Giacomo’s father, Carlo, who has been growing grapes in Bramaterra since the early 1990s. This property has quickly become one of the gems alto piemonte, especially in the Lessona and Bramaterra growing areas. Cantina / Cellar: Fermentation in concrete tanks with native yeasts; aging in used barriques. No filtering, fining, or other additions. Il Vino / The Wine: An Alto Piemontese Nebbiolo blend of special elegance, due in part to its strong vein of minerality. A Tavola… / At the Table… Drink it with meat, especially braised meat, game, and game birds. Vitigni / Varieties: 70% Nebbiolo, 20% Croatina, 10% Vespolina. Data di vendemmia / Harvest date: Around October 10th. Metodo agricolo / Agricultural technique: Practising organic; copper, sulfur. Fermentazione alcolica / Alcoholic fermentation: 18 days in concrete tanks, without temperature control. Fermentazione malolattica / Malolactic fermentation: Spontaneous, in May-June. Affinamento / Élevage: 24 months in second and third passage barriques. Zolfo / Sulphur: 52 mg/L total, 25 mg/L free. Produzione annua / Annual production: 3500 bottles.